The Amplifier and Loudspeaker No. 12A, sales name HARMONY, is a loudspeaking telephone attachment which can be added to existing handset telephone installations, (except Internal Telephone System) to provide full, voice-switched, loudspeaking telephone facilities. Colours: dark brown, light brown and mid grey. The circuitry of HARMONY is based on that of the DORIC (Amplifier and Loudspeaker unit No. 11A), which it will eventually replace. The case has been styled to be compatible with the Herald call connect system and the Ambassador telephone range. The HARMONY incorporates a line connect relay which operates when the "on" button is pressed, this connects the unit across the line pair and disconnects the telephone instrument. The relay has an additional break unit which is brought out onto terminals T9 and T10 for use on C wire signalling PMBX extensions. 1. Drum Wheel Volume Control To adjust the incoming speech level. 2. A red light emitting diode (LED) indicator, which is illuminated when the HARMONY is switched on. Mute Key - Marked M Depression of this key will mute the microphone such that the distant party cannot hear conversation taking place in the vicinity of the HARMONY. The key must be held depressed throughout the required duration. On Key Depression of this key operates the line-connect relay which connects HARMONY to the line. Off Key Depression of this key releases the line-connect play and restores the line to the telephone instrument. 2A and 105/107 (main)          		1A, 4 and 105/107 (extn). its cradle. replaced on its cradle. to the level you prefer. to line before the HARMONY "on" button is pressed. must not be replaced on       on its cradle. volume to the level you       prefer. using the telephone           press the "off" key. handset will terminate        using the telephone handset. The unit uses voice switching techniques to prevent acoustic feedback or howl when the apparatus is in use. The housing is designed to provide acoustic isolation between microphone, (which is an electret type situated behind the front edge of the unit) and loudspeaker, (situated under the grill to the rear of the unit). The unit possesses omni-directional characteristics, and functions without the user having to be situated close to the microphone. The unit employs circuitry which virtually eliminates speech clipping in normal use and also has a degree of tolerance to constant background noise without switching permanently to the 'Send' mode. However, to achieve good performance the usual requirements for room acoustic conditions still apply. Power for the HARMONY is provided by a transformer unit 17A which transforms mains voltage to 18v a.c. The Transformer Unit 17A is a plug top type transformer for use in 13 amp 3 pin mains socket outlets and incorporates a 100mA input fuse. 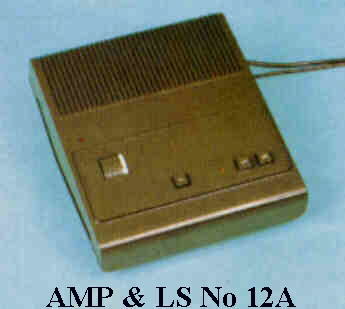 The Harmony Loudspeaking Unit (Amplifier & Loudspeaker 12A) is an add-on module giving loudspeaking telephone facilities when used with a handset telephone. It can be used alongside the associated telephone, or mechanically linked to other units in the BT house style - such as the Ambassador telephone and the Herald call-connect system terminals. Harmony is derived from the Loudspeaking Telephone (LST) 8 (Accord) and its operation in loudspeaking mode is identical. One of the development aims was to obtain a better performance than the LST4. Also it was decided that it would be more cost-effective to use an existing design. if one could be found with suitable performance - rather than developing new loudspeaking circuitry. To this end, a licence was negotiated with Northern Telecom of Canada to use the design of their ‘Companion’ unit; a limited number of which were already marketed by BT as the ‘Doric’. So development effort was concentrated in re-engineering the circuit to fit into an Ambassador style case. The circuitry is such that only two adjustments are needed during production. One ensures that the output voltage of the power supply is set to 1 2V, and the other is to balance the send and receive switching levels. It is not intended that these adjustments should be carried out in the field. To prevent feed back from the loudspeaker to the microphone it is necessary, using present technology, to use voice-switching techniques to allow either the LST user to speak to the distant party or the distant party to speak to the LST user - but not both at the same time. The direction of transmission is decided by a circuit which continuously monitors the signals received from the microphone and the telephone line. Priority is usually given to the loudest signal if both parties are speaking simultaneously, but after the direction of transmission is selected, a very loud signal in the other direction is required to interrupt the original party, except during pauses in speech. This feature is known as ‘switching hysteresis’ and is deliberately provided to prevent the unit from continually switching between channels under marginal conditions. There are two circuit problems with voice-switching LST's. The first is the time taken to decide the direction of transmission and to switch the unit to that direction. This can result in the first part of a word being lost - known as clipping. The second is that room noise tends to cause the unit to assume that the noise is a wanted signal and switches into its send direction. The distant party then has to speak very loudly in order to overcome the noise level - due to the hysteresis described - and the LST reverts to the send direction during pauses in the distant party’s speech, In extreme cases, the distant end user will be unable to overcome the noise at all. When neither party is speaking, the unit will be in the centre state. This helps to speed up the unit switching when one of the parties speaks as it is already halfway between the send and receive states. As neither channel is attenuated completely, the first part of the sentence is audible, although at reduced volume. If noise is present together with wanted speech at the LST microphone, the unit switches to send, but inserts an extra 10 dB attenuation in the send channel. This reduces the levels of both the noise and the speech sent to line. This may appear to be a disadvantage, but as a user tends to speak loudly in the presence of noise, compensating for the attenuation, the overall effect is to reduce the level of noise sent to line. thus maintaining the level of speech. The second feature is that the unit ignores any room noise if there is no speech signal present - so overcoming the second problem previously described. During the development of Harmony it was felt desirable to avoid the normal BT power units which were large and usually required fixing to a wall. The transformer unit 17A - a plug-mounted transformer providing 20 volts ac nominal at about 250mA was selected. Connexion to the power unit is by screw terminals which are shrouded for safety on the underside. Protection is provided by a standard replaceable mains fuse and a non-replaceable thermal fuse which operates if the internal temperature rises above 125 degrees C.
Taken from Maintenance News - No. 21 - Autumn/Winter 1982.